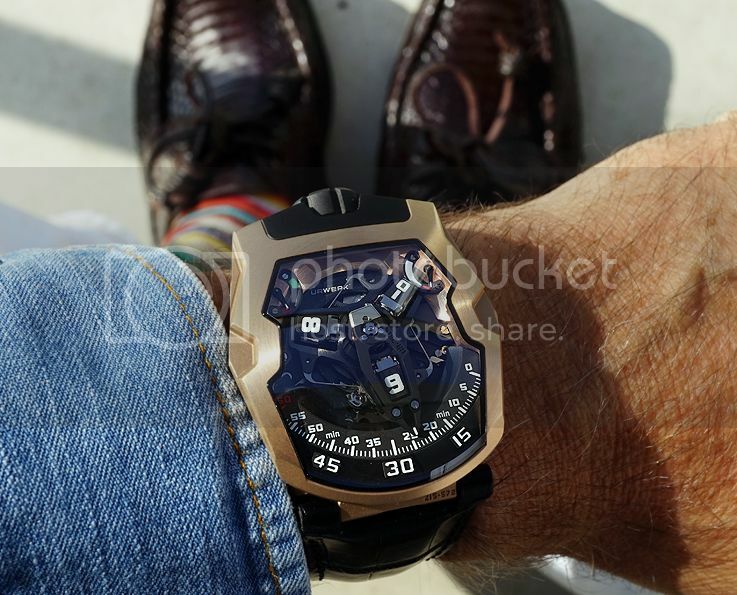 Every time when URWERK's Felix Baumgartner & Martin Frei, each a genius in their own right, present a new timepiece, I am astonished by what they have created again. Not that I am always in love with everything the brand presents, but when these guys come up with a concept, like the 103, 201, 202 and of course the very new 105M, I am sitting front row to hear the news. but I was however afraid that the watch would be large on the wrist. And in fact the 210 is a little larger than the 103 series. On the wrist however it does not behave that differently. The fit on my 18cm wrist felt very solid and good and is very close to the feel of my 103. 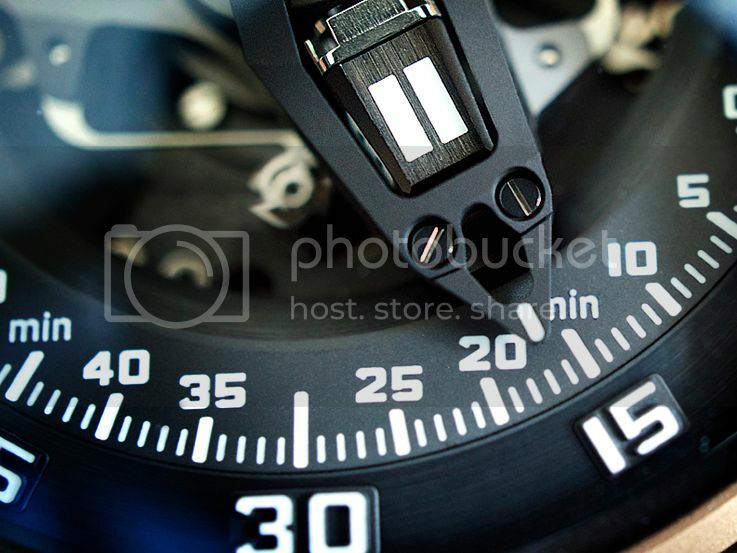 The following pictures should give you an idea, how the watch behaves on an average wrist. 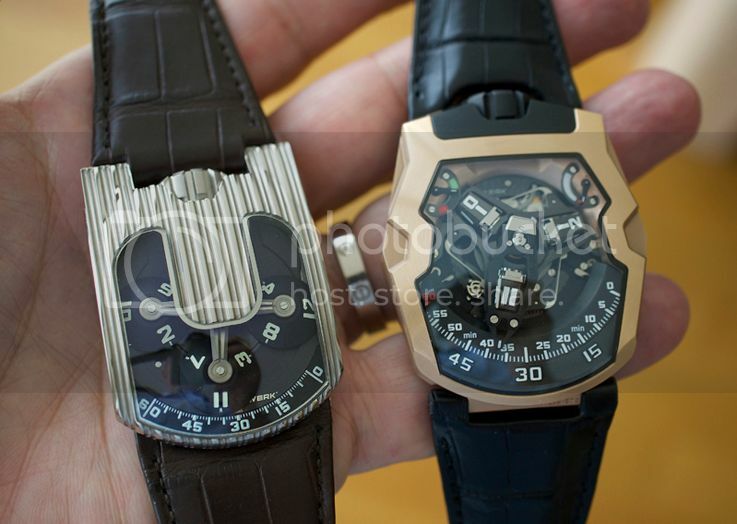 The Urwerk 210 however, is a very different experience and it is in fact impossible to compare to any other watch and while the concept of the 210, may look familiar with other Urwerk models, the timepiece is way different and is much more about the interaction between the watch and its owner. 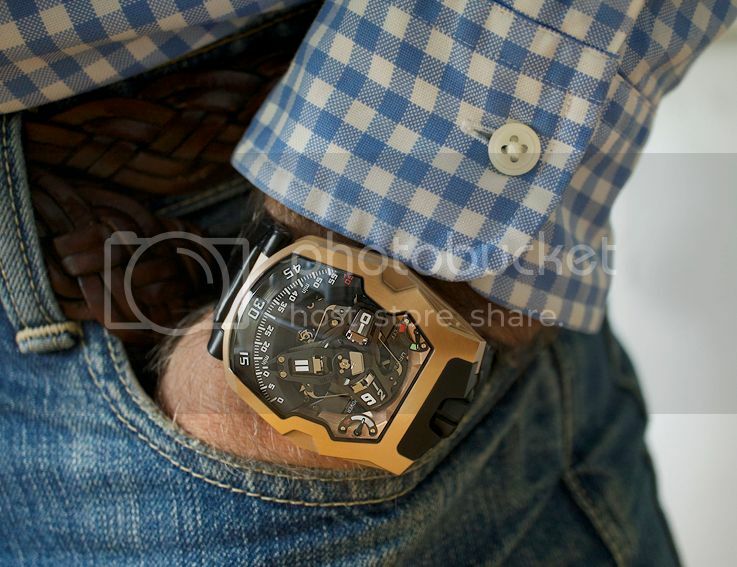 The Urwerk 210 is powered with the UR-7.10, an automatic caliber, developed by Urwerk, with a power reserve of 39 hours. Like more automatic watches there is a meter for the power reserve. Really new however is (and located in the left upper corner) another meter, with a red and a green zone. 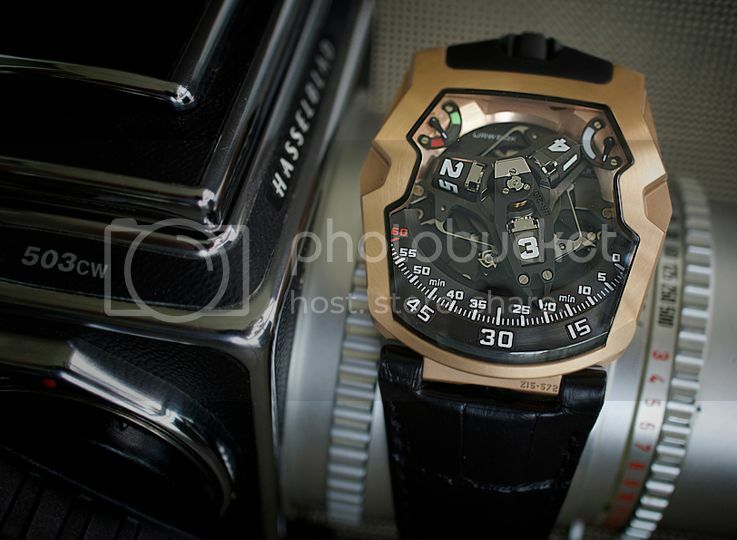 This is the so called winding efficiency meter, a very new complication and a first for Urwerk. The winding efficiency meter is an instrument that gives information about your physical movements. When the watch has not been moved, during the night for instance, the meter dropped to the red zone. During the day however, when you're busy and running around, the meter will move up to the green sector, indicating that there is enough activity to power the watch well. On a lazy day however, when spending the day watching the sport games on TV, the meter could go down to the red area, telling you that, you're not active enough to wind the caliber sufficiently. The watch will use its build up power reserve. In this case one could wind the big crown a bit, or put the switch, located on the back of the watch on the back to 'FULL'. The watch will then still be wound, even while the activity is low and on normal and active days, it can be turned to 'REDUCED' efficient. In case the watch needs to be completely protected and the turbines need to be fixed, during very heavy sports or during a courier transport for instance, the switch can be turned back to 'STOP'. 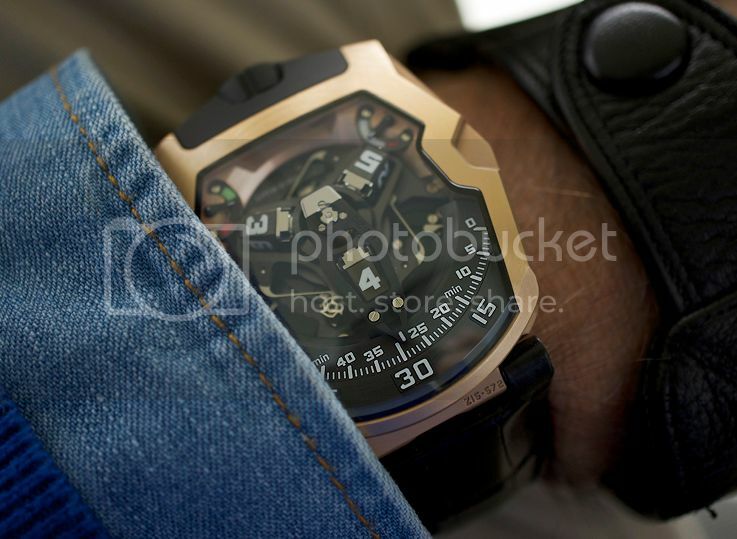 Earlier I mentioned the word interaction and this is what I meant with the interaction between the watch and the owner. Of course the watch can always be wound with the large crown at the top of the watch. In general I like to play with the controls a bit, especially when I am waiting somewhere. Just before the new hour begins, it is fascinating to watch what happens. The function of the prominent retrograde minute hand is to enclose the hour satellite and indicate the time, as it moves forward along the 0-to-60-minute scale. As soon as the Retrograde hand passes the 60 min indication on the scale, so just before the new hour starts again, a soft but hearable "click", indicates that the Retrograde hand jumps back to zero; where it picks up the new hour, to start its trip along the minute tracking. This happens of course amazingly fast and in fact in less than 0.1 of a second, the hand flies back to its start position. 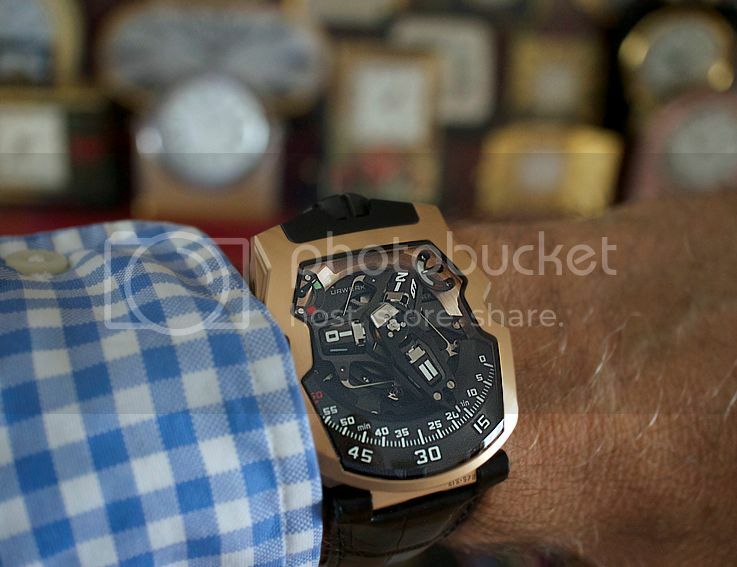 The Urwerk 210 is available in four different versions, from the pink gold and titanium version to the more sporty titanium & steel and from the titanium & AITIN treated steel, to the titanium and steel. All share the same in house built automatic UR 7.10 caliber and all four models are water resistant to 3 ATM. 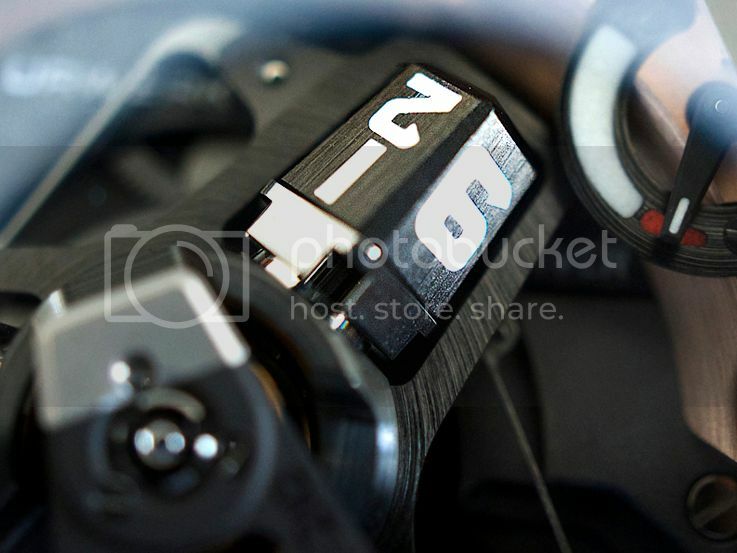 Photographs of the different 210 models can be found at the URWERK website.